Click here to see the live version on Tableau Public. I stumbled across an interesting Tableau community project recently, called the Tableau Reviz Project, started by Matt Chambers, Nelson Davis and Alex Duke. The idea is that each month the Reviz founders will select a topic and a dataset, create their own visualizations and then open it up to the public for entries. The first topic was a difficult, tragic subject: data relating to firearm deaths. The data itself is available for download here from the Reviz project. It is sourced from the Centers for Disease Control and Prevention. The chart highlights the large number of suicides that occur each year in the US, which receive much less discussion than homicide firearm deaths. 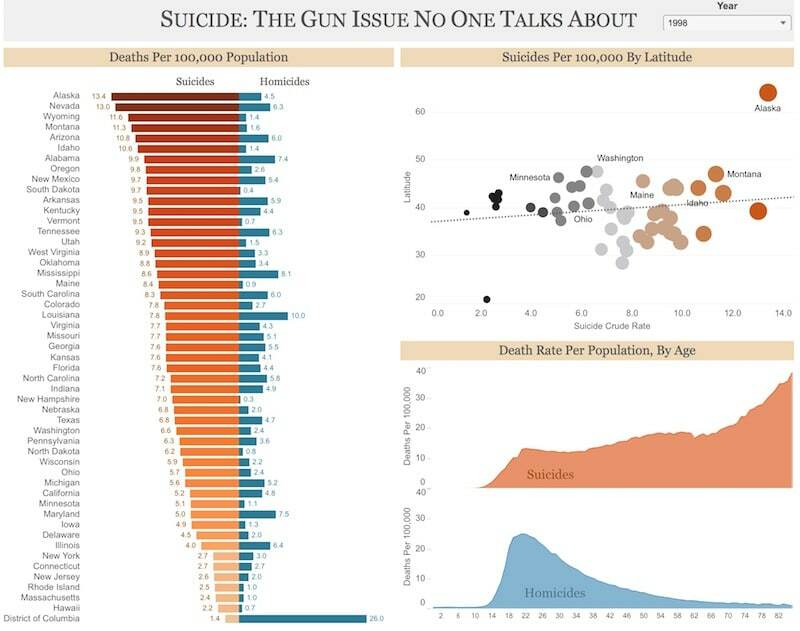 The visualization also explores whether there’s a correlation between the latitude (how far north) of each state and the number of suicides per 100,000 population. The states further north have fewer hours of sunlight and long, brutal winters and I expected to find a correlation between these states and higher number of suicides. Alaska fitted this bill, having one of the higher suicide rates. However, overall, the relatively large p-value indicated weak evidence. The most interesting finding perhaps then, was the chart showing the rate of firearm deaths by age. One can clearly see that homicides are skewed towards younger generations, but suicides skew towards older generations. Thanks to the Reviz team for putting this challenge together and for bringing attention to this issue.